As we mentioned in our last maintenance letter back in December, we promised to begin sending these letters out again in the Spring as the water tempuratures began to rise. This past winter saw some very low tempurares, extreme low tides and a lot of ice! Please, check your cages for damage. If your cages have been bent by the ice, they are easy to bend back into shape. If they are beyond repair, call Julie at 410-822-9143 to get replacement cages. Routine maintenance of your cages witll help to prevent/ control fouling, which will allow the oysters to grow more quickly and the cages from becoming too heavy. Our volunteers who will be picking up your oysters on June the 1st– they will be leaving your cages on your dock when they are done- thank you in advance for the time and effort you expend now to remove the winter growth from your cages and the very simple weekly routine maintenance you will engage in for the next month or two after this initial cleaning. It will save them a great deal of time and effort when they do the pick-up! When I tended to my oysters on Sunday, I was a bit surprised by the amount of fouling that had accumulated on the cages since December. I actively dunked each cage up and down to remove the loose debris and accumulated silt and sediment from the cages and oysters. I removed the clasp on the cage and dumped the oysters onto the dock. Using a scrub brush – and scrubbing awayfrom me – I scrubbed all 6 sides of the cage – both the inside and the outside – as well as the part of the rope that had been immersed. Then, I dunked the cage up and down in the water to rinse it off. I repeated this process two or three times until all the growth was removed. I then put the oysters back in the cage and secured the clip to keep the oysters from falling out. The oysters still had a good deal of sediment on them, so I gave them a good shake to keep them from growing together, I spread them evenly on the bottom of the cage and then gave them another good dunking to remove the rest of the silt and sediment. When I was finished, the cages looked almost brand new! Now that the chance of a freeze has finallypassed, it is important that you tie your cages so that they are about six inches below the surface of the water atlowtide. It is critical that the cage is NOT resting on the bottom of your creek or river. The oysters can smother and die if they are allowed to sit on the bottom! The oyster pick-up will be on Friday, June the 1st. Between this initial cleaning and then, I think that the weekly maintenance will mostly consist of pulling the cages up once a week, giving them a good dunking and letting them sit on the dock for an hour or two to let the sun and air dry out and kill theprevious week’s accumulated fouling. I will be sending out letters just about every week between now and then to keep you posted. I realize that some of you do have a hose at your dock, but not everyone does and/or you may not have turned on the water going to your dock yet. I did use a hose on one cage just to see if it was quicker that way – but it wasn’t. It actually took me longer! Please clean your cages in the manner that is best and easiest for you. We want to thank you again for your participation in our oyster-growing initiative. When we do the oyster pick-up, we will have completed our seventh growing season. In our first year, we had 16 growers. This year we have 385! Every June, we have a very nice reception for our growers – we call it our “Oyster Social” – as a way of saying thank you for your participation. It also affords you the opportunity to bring a neighbor who may also be interested in becoming a grower! We will be sending you a save-the-date card very shortly. Thank you for all of your time and participation in our program. In the past, the fouling of the cages has been a very big issue at both pick-up and delivery. It has made our volunteer’s jobs verydifficult. 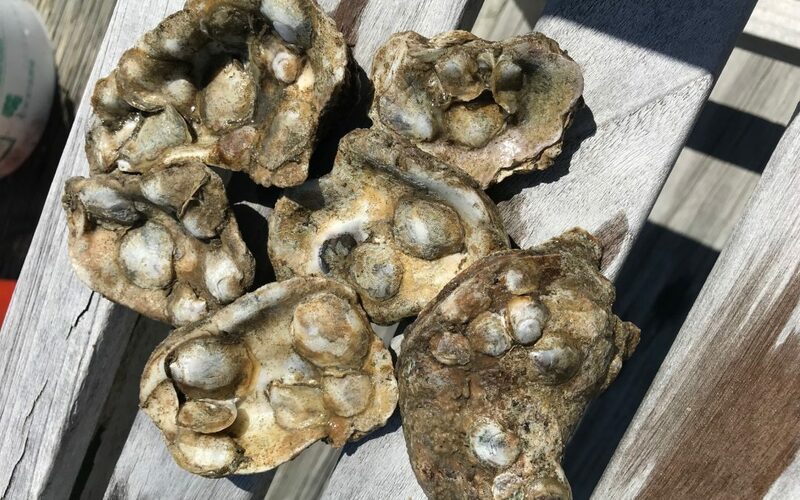 The extra time you are taking now to clean the cages before the water really warms up and the fouling gets bad as a result and the several minutes that you will expend each week for routine maintenance between now and the oyster pick-up will make that very big issue go away. We thank you for you help!